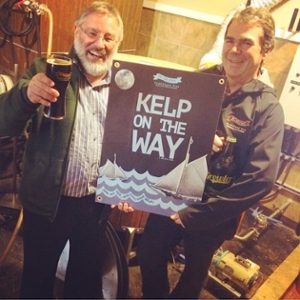 The latest beer from Picaroons Traditional Ales, a brewing company in Fredericton is made with one of the organically certified kelps, the sugar kelp Saccharina latissima, grown at an Integrated Multi-Trophic Aquaculture (IMTA) site in the Bay of Fundy. Dr. Thierry Chopin, UNB Saint John biology professor and scientific director of the Natural Sciences and Engineering Research Council of Canada’s Integrated Multi-Trophic Aquaculture Network (CIMTAN), approached Picaroons to make a beer using organic kelps. These seaweeds, with superior sweetness and flavour, are rich in proteins, trace minerals, phytochemicals and vitamins, and low in fats. They are rich in alginates, which we already use in our everyday life (as extracts to keep pulp in suspension in an orange juice in the morning, to giving the paste texture in the toothpaste we brush our teeth with in the evening), but can also be viewed as dietary fibers. Because of their composition and attributes, some nutritionists believe that, in fact, kelps should be recognized as being on par with other well-known superfoods. “It’s kelptastic - it’s exactly what we wanted! A kind of toffee impression mixing the sugar and the salt together,” adds Chopin. For Chopin, seeing how the first batch of 600 litres of ‘Kelp on the Way’ went in less than three days, and reading very positive feedback comments, is a clear indication that the recipe was right. The development of a very smooth beer with character and the combination of two great Maritime stories is certainly a winner. “Picaroons is a well-regarded microbrewery from New Brunswick, with a great sense of humour for developing unique beers with equally amazing names. This beer also represents our efforts at diversifying and commercializing our differentiated IMTA products,” said Chopin.